It's taken me far too long to blog this, but it's been a whirlwind of a week & a half, & I needed some time to process. 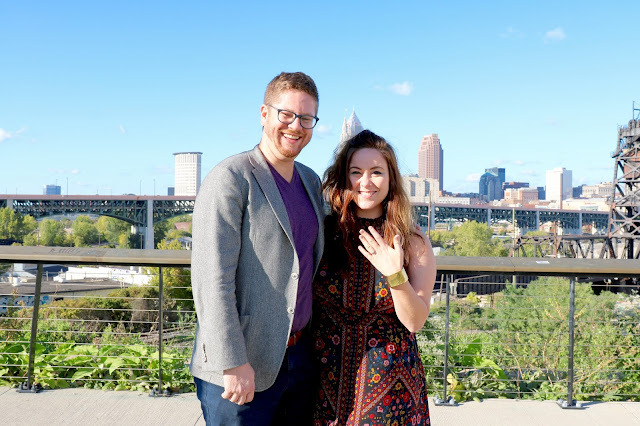 If you follow me on social media, though, you already know the news: Mike & I are engaged! 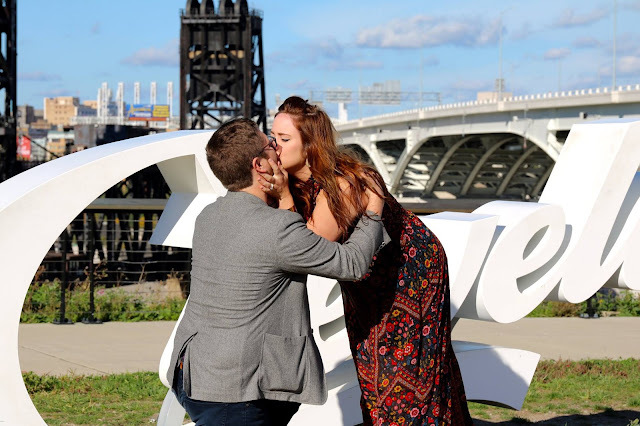 The weather that day was gorgeous & I'd recently lamented our lack of decent selfies, so on our way to dinner, Mike suggested we stop at the script Cleveland sign in our neighborhood, which has a great view of downtown. 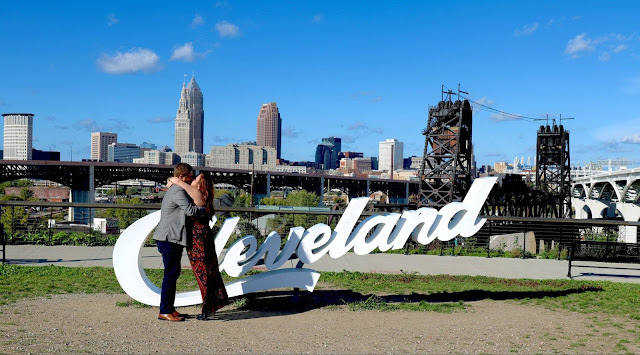 It's a popular photo opp spot, so there's sometimes a line, but when we arrived, the only other person there was a photographer snapping skyline shots off to the side, so we moved toward the sign to take our selfie. When we got to the sign, Mike pulled me close & began to talk about our life together, about starting the next chapter. 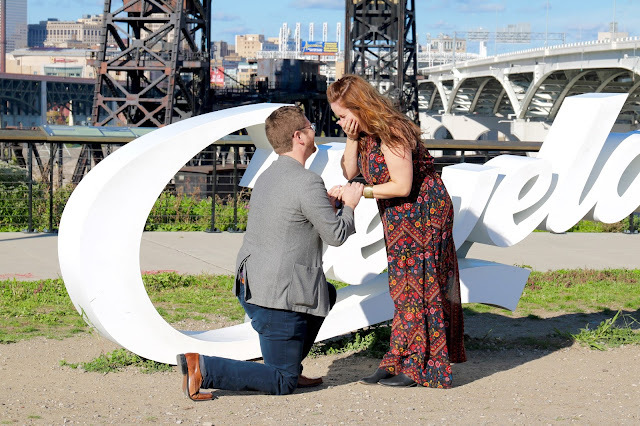 Just as I realized what was happening, he dropped to one knee... & then I think I blacked out. OK, I'm mostly joking, but it was a total blur; I felt like I was watching this major moment happen from afar, as though we were characters in a movie. "Will you marry me?" he asked, & I think I just stared at him for awhile, blinking & smiling, before I could even speak. When I finally did, the answer, of course, was "Of course!" And then I realized that the photographer behind us was photographing us - that she wasn't a random photographer but our photographer, someone Mike had hired to capture the whole moments on (digital) film. He waved over his coworker Ally of Allison Kurz Photography, who congratulated us & took a bunch more photos. ...& when we reached the top of the steps, I saw 20 of our closest friends & immediate families, all with smiles on their faces & congratulations on their lips. My childhood BFF had even driven up from Tennessee! Do you know how incredible it is to be at a party full of so many of your favorite people? For the next few hours, we celebrated with tater tots & Great Lakes Beer & cookies iced with our initials as '90s tunes played in the background. It was perfect. And it was perfectly us. When it was over, we gathered some friends & hit up our favorite dive bar to extend the celebration & enjoy the weather. The next day, we met my family for brunch at one of my favorite restaurants, & then we finally relaxed because we deserved it. Whew. What a weekend! 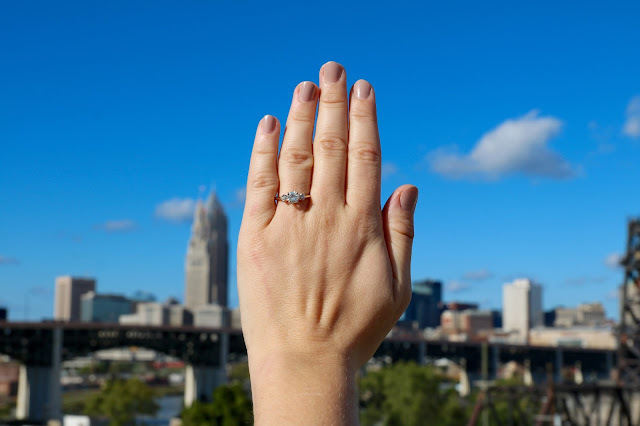 I knew within three months of dating Mike that I wanted to marry him, now that it's official - now that Iand know I get to marry him! 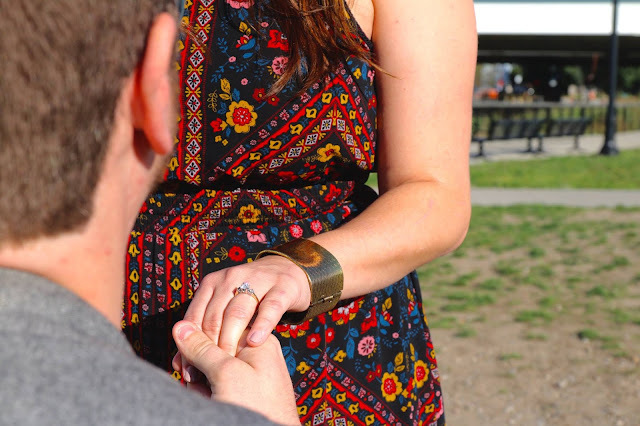 - people keep asking us what it's like to be engaged. I guess I always thought it would feel crazy & stressful & OMG-so-romantic-at-home-all-the-time, but the truth is that life mostly feels the same. 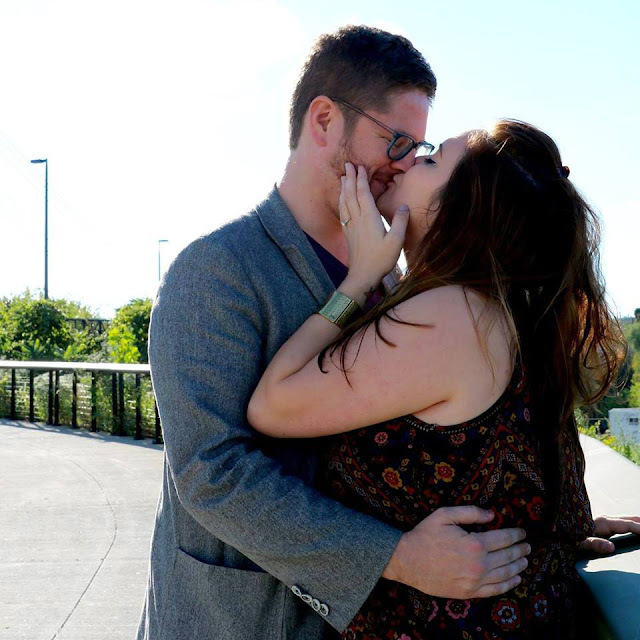 I'm thrilled that we've made it "official," but we're still just us, reading books on the couch at night & eating chicken teriyaki for dinner & messing with our cat - &, you know, planning a wedding. For the most part, life feels exactly the same as it does every day, in the best way possible, because we already led a life we love - a life that's full of love. I am so honored to spend the rest of my life with this man by my side. He is my biggest supporter, my best friend, &, as cliche as it sounds, the love of my life. He has changed me. He has bettered me. He has made me happier than I ever knew was possible - & I look forward to many, many happy years together to come.